Eating fruits can be fun! That’s why the Carl B. Stokes Head Start Center launched the “Mighty Tikes” program for students and parents. The program allows the students to see healthy eating in a fun way, by incorporating games and physical activities. The students saw different fruits and vegetables, took turns guessing what each one was and matched them to colored circles they had laying on the floor. They also talked about what fruits and vegetables they enjoyed eating, and which ones they haven’t tried yet. The program isn’t just for kids! It also gives parents ideas about healthy recipes and ways to incorporate more fruits and vegetables into meals at home. 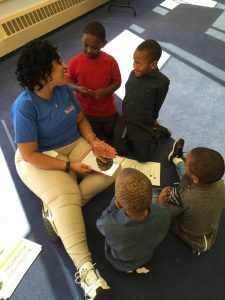 Carl B. Stokes Head Start Center is a designated Ohio Healthy Program site, so the “Mighty Tikes” program is just one way the staff engages families in healthier practices throughout the year. 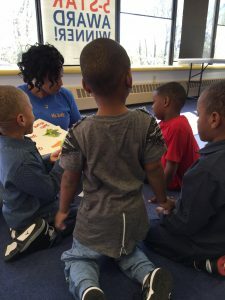 In addition to talking about healthy eating, the “Mighty Tikes” program emphasizes healthy minds. At the start and end of the program, the students sang a song called I Am Special – reminding them that they are unique and important! The “Mighty Tikes” program is held for Carl B. Stokes Head Start students and families every month. Check out more pictures from this month’s event below. 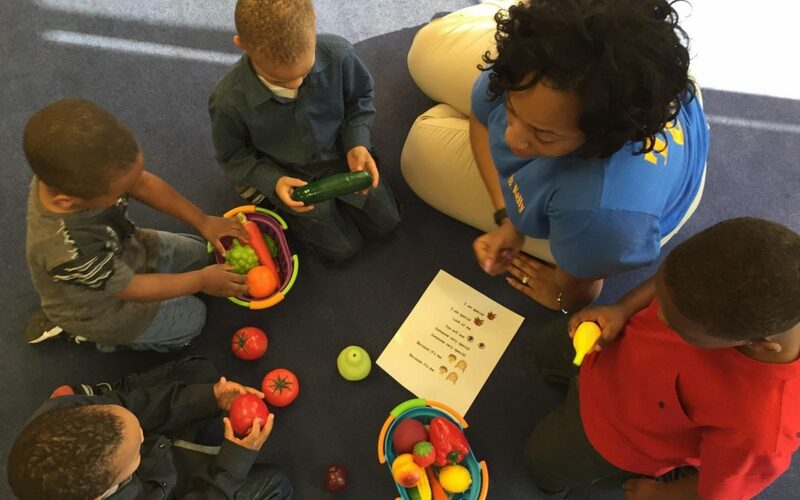 The “Mighty Tikes” participants look at different fruits and vegetables and talk about the ones they like and dislike. The students and the instructor, Miss Kelly, sing “I Am Special” at the end of the event.